Multiple bomb threats have been investigated in Taber on Friday, which have included three schools within Horizon School Division No. 67, and Wal Mart, making for a long day for local emergency services. Horizon School Division schools received three anonymous bomb threats, with the latest coming in the early afternoon on Friday at Central School. Given school is half days on Fridays, students had already been dismissed for the weekend, and were out of the building at the time. Taber Police Service searched the school, and like the the other two threats, it was deemed a hoax, according to division correspondence. The earlier bomb threats were aimed at L.T. Westlake Fine Arts Elementary School and the D.A. Ferguson/W.R. Myers school complex earlier in the morning, via an anonymous voice message. The police were immediately contacted and responded to the incident as per their protocols. Given the size of the D.A. Ferguson and W.R. Myers complex, and the fact that it is under ongoing construction, D.A. Ferguson, W.R. Myers students and Taber Mennonite School students who were at W.R. Myers were evacuated. Police determined that there was no need to evacuate L.T. Westlake. The police were able to quickly determine there was no threat at the school and students returned to regular classes by mid-morning. Counsellors and other staff continued to be available at the schools to attend to any matters the students or family members may have had as a result of the incident. 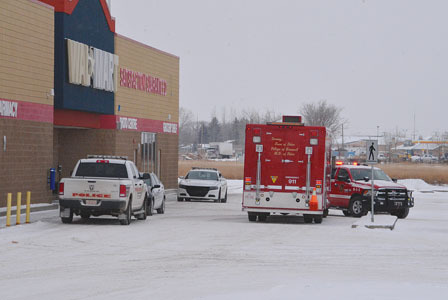 A second bomb threat was being investigated at Wal Mart near the east side of town as of late afternoon, along with one on Thursday night, in which Taber Police Service and the Taber Fire Department attended the scene. The store was evacuated. The police are continuing the investigation to determine the source/sources of the threats. On its website, Horizon gave tips parents could use in helping their child deal with the stress of a bomb threat along with looking for signs of stressors. They encouraged follow up with contact numbers, if family had any further concerns regarding the incidents in question. As of late afternoon, comment could not be reached from the Taber Police Service or Taber Fire Department with both crews busy throughout the day and afternoon in their investigations.